The Land Transportation Franchising and Regulatory Board (LTFRB) has announced it will launch, yet again, a crackdown against so-called “colorum” or unauthorized ride-sharing cars starting September 1, according to news reports. It had previously announced a similar move, set to begin August 1, but deferred it by a month. Since early this year, the regulatory body has been trying to get transport network vehicle service (TNVS) providers, which is what the private ride-sharing car drivers and owners are officially called, to apply for certificates of public convenience (CPC). The CPC, which is valid for two years, constitutes the TNVS operators’ permit to operate. While processing CPC applications, the LTFRB issues a provisional authority (PA), which is valid for 45 days and needs to be renewed repeatedly until a CPC is acquired. TNVS operators without a CPC or PA are considered “colorum,” a word that was used to refer to an anti-government religious organization in the 1950s but is now a slang term for illegal land transport operators. 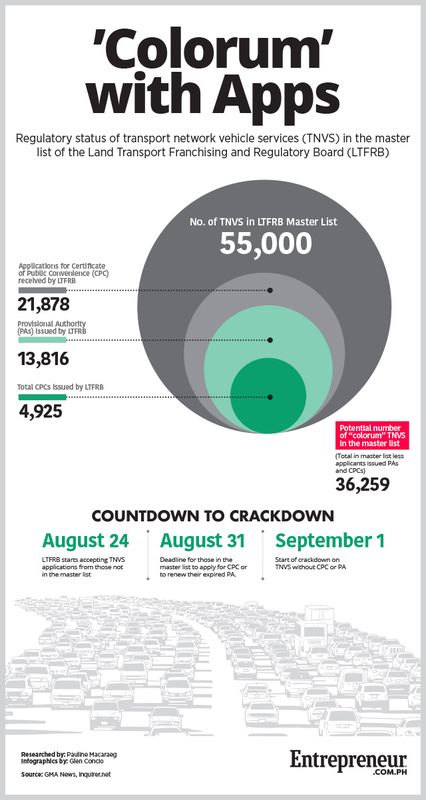 LTFRB Chairman Martin Delgra III said the LTFRB will accept applications until August 31 from TNVS operators included in the 55,000 master list submitted by Grab and Uber early this year, the Philippine Daily Inquirer reported on August 24. After that, it will begin to go after those without permits starting September 1. He added that the regulatory body will begin accepting applications for an additional 10,000 TNVS providers not in the master list, the Inquirer also reported. The LTFRB has set a cap of 65,000 TNVS operators in Metro Manila. “This will result to a pool of TNVS that will be opened to accredited TNC providing this mode of public transportation making it more responsive, competitive and safer for the public,” the LTFRB said in a statement. Yet, despite the threat of being caught operating a ride-sharing vehicle without the necessary permit, the number of applications for LTFRB permits remains quite low. If caught, “colorum” vehicles could be impounded and their owners subjected to hefty fines. According to Delgra, the regulatory body has received only 21,878 applications for TNVS operating permits since March, according to the Inquirer report. That’s only 39.8 percent of the 55,000 total number of TNVS operators in the master list submitted by Grab and Uber to the LTFRB earlier this year. The low number of applications received comes as a surprise especially because transport network companies (TNCs) that operate the online ride-sharing platforms already extend assistance to their partner car owners and drivers in dealing with LTFRB. Grab, for example, has a booth near the LTFRB office to help their partners while Owto has signed up a law firm to assist its drivers. However, the view from TNVS operators and drivers looks different. Those reached by Entrepreneur Philippines expressed largely adverse reactions to the new threat of a crackdown from LTFRB. Another Grab driver suspects that many of the 55,000 TNVS operators in the master list are no longer interested in applying for a permit because they have become inactive.